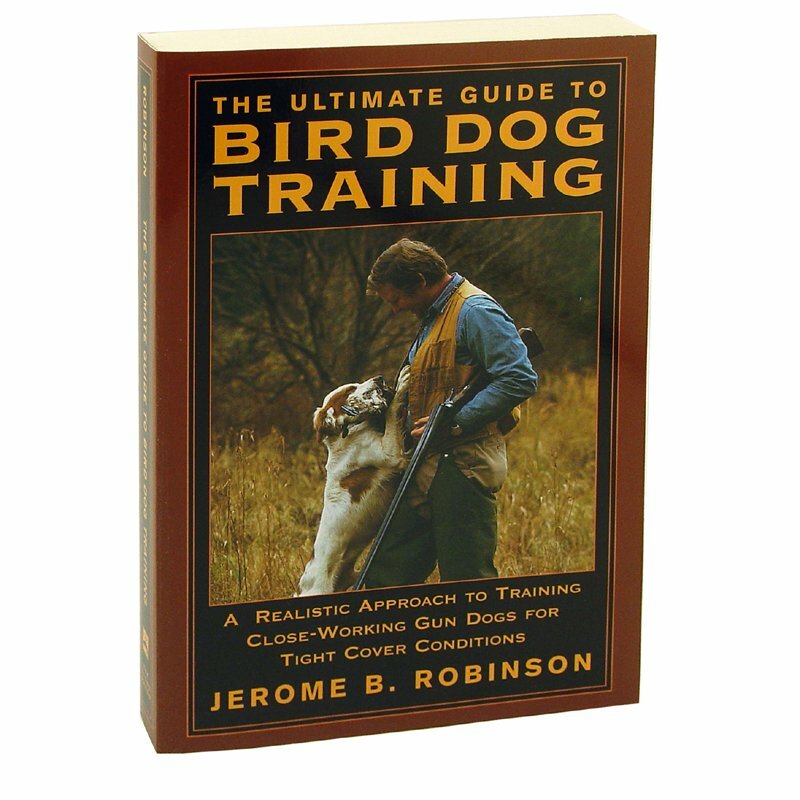 The Ultimate Guide to Bird Dog Training by Jerome B. Robinson. $14.95. Today we're looking at Jerome Robinson's "Ultimate Guide to Bird Dog Training." This is one of my favorite books that we sell, mainly because it's highly focused on birds in training. It's designed for the walking upland hunter who is looking for a closer working dog, for folks that have the ability to use a lot of birds in their training. Birds are a key part of training, but Jerome really focuses on that. And it's a key part of how he introduces the dogs to everything. So I've just enjoyed the method. It works well. But keep in mind you've got to have access to a lot of birds and you've got to have the ability to work your dog on a lot of birds for this method to work for you. Check it out. "Ultimate Guide to Bird Dog Training." "One of the best gun dog training books I've ever read." This is a great product. One of the best gun dog training books I've ever read. The service was also excellent. The book came within 3 days. I'd recommend this book and this site to everyone. The book has been great. I've learned a lot, and it's very informative. "This was a great book." This was a great book. It gave me some new ideas and training methods I am now putting to good use. very informative, well written and simple to understand. Very informative and easy as well as enjoyable to read. "In-depth information makes it easy to understand how to train a dog to hunt." Well written and easy to understand. In-depth information makes it easy to understand how to train a dog to hunt. I have never hunted a dog before, so I bought it more to understand the intricacies of the point, flush, force fetch and how to train. Ideally, if I had more land, more time and birds regularly available to me, I would use this book a lot more. "An oldie, but a goodie. Picked up several tips." An oldie, but a goodie. Picked up several tips. Easy to read and understand the psychology of what's going through your dogs mind when trying to instill certain behaviors. For walking upland hunters wanting closer working dogs and have access to lots of birds for training. The Ultimate Guide to Bird Dog Training explains how to train a bird dog to hunt at a pace that suits a man walking, and to point and hold birds with all the elegance and style of a field trial champion. It combines successful traditional methods with modern electronic techniques to show how the nation's top professional gundog trainers develop reliable hunting dogs that are easy to control, exciting to watch, and stylish on point. The author has traveled around the United States for more than 30 years studying how professional trainers develop the most dependable and enjoyable hunting dogs and passing that information along to readers. 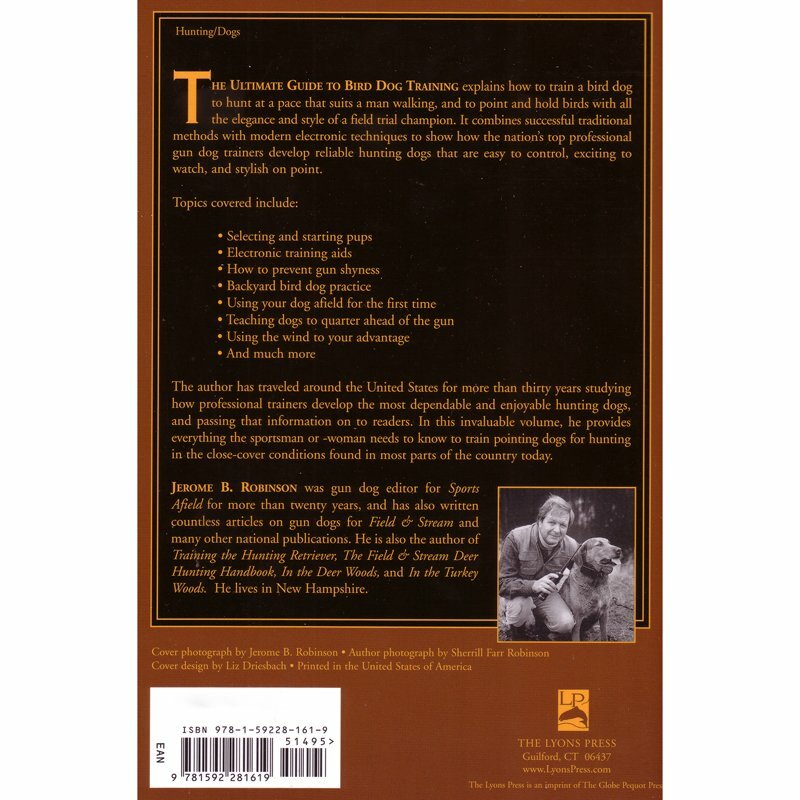 In this book, he provides everything a reader needs to know to train pointing dogs for hunting in the close-cover conditions found in most parts of the country today. One of the greatest things I ever did for the readers of Sports Afield during my editorship there was to make Jerry Robinson Gundog Editor. Today, my esteem for his prose and knowledge is still without limits. Follow Jerry Robinson and your path to glorious and golden upland gunning over a great dog will become clear. Here, in one book, you will find everything you need to save time, money, and aggravation in developing the hunting companion of a lifetime.